I read this and thought of you. It has been two weeks since I made the move to this website. And I can not say thank you enough for making this transition an encouraging one. This week will be the official saying goodbye to joyfuljava.blogspot.com. I will no longer be typing over there to refer people here. So bittersweet. The Lord birthed a ministry in that space. Every day for two years He and I did something in that home. But let us not give up meeting together, as we are in the habit of doing. Let us continue to encourage one another — here. 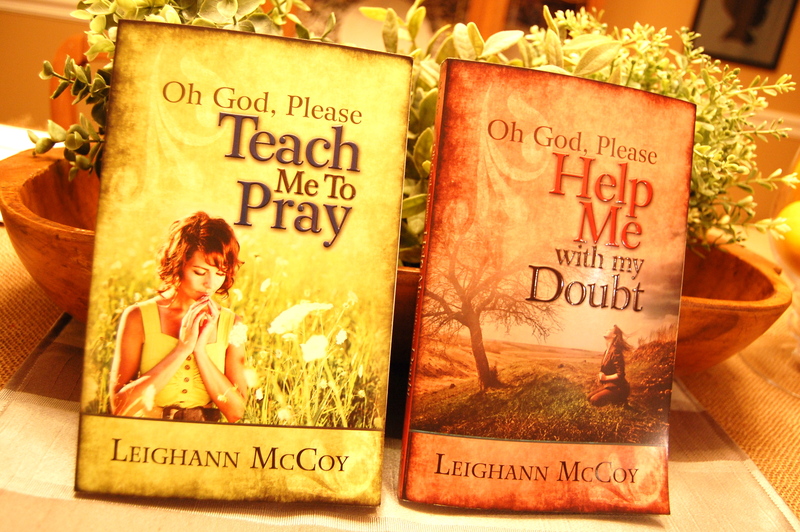 Leighann McCoy is the founder of Pray All the Way Ministries. She is a speaker and a writer who birthed a ministry out of a desire for people to experience intimacy with God as they learn to trust Him in all of life’s circumstances. Leighann combines spiritual depth with honest humor as she tackles real issues with a dose of laughter and loads of practical application. Leighann’s life has been full of adversity and trials. As a young wife she faced years of infertility and presently is bravely battling a fight with cancer. She writes from experience and her cry, “Lord, Help Me With My Doubt,” is most certainly un-cliched. Leighann relies heavily on the power of prayer and longs to encourage you in your own prayer life… deepening your communication with your Heavenly Father and teaching you to walk in faith and not fear, in every circumstance. To win these two books, simply sign up to receive regular emails from this website, beckycrenshaw.com. I will choose one email address from my email subscribers. That’s it. Easy-Peasy. So…if you already subscribe via email, then you are already entered. If you are still receiving emails from joyfuljava.blogspot.com then sign up here! Do you see the “Type Your Email HERE” corner up there? Top right hand corner? That is where you need to type in your email address. Once you do, WordPress will send you a confirmation email. Confirm and you are entered! Give away ends tomorrow night, August 24th, at midnight. Love love love… I am excited!